Wishing Jedidiah Duggar and Jeremiah Duggar a Happy Sweet 16! Happy birthday Jef and Jer!!! Have a great day!!! Happy Birthday Jedidiah and Jeremiah. I hope you have a wonderful day with family and friends. Happy birthday Jed and Jer! I hope y'all have a great day! Happy Sweet 16 Jed and Jer. Happy 16th Birthday Jeremiah! Enjoy your day. This is just a random question...How many sets of twins do the Duggars have? HAPPY BIRTH DAY JEDIDIAH AND JEREMIAH !!!!!!!!!!!!!!!!!!!!!!!!!!!!!!!!!!!!!!!!!!!!!!!!!!!!!!!!!!!!!!!!!!!!!!!!!!!!!!!!!!!!!!!!!!!!!!!!!!!!!!!!!!!!!!!!!!!!!!!!!!!!!!!!!! What are these two fine young men going to with THEIR lives...should be the question here. God helps those who help themselves. The Almighty does not want to stamp the ambitions out of you. If you want God to guide your steps, you have to move your own feet. No choices for them at all, really,, isn't it clear? Even less for their daughters. Happy Birthday to two fine young guys. Pursue your own dreams and ask God to help YOU with THEM. I like these two kids. Happy Birthday!!! 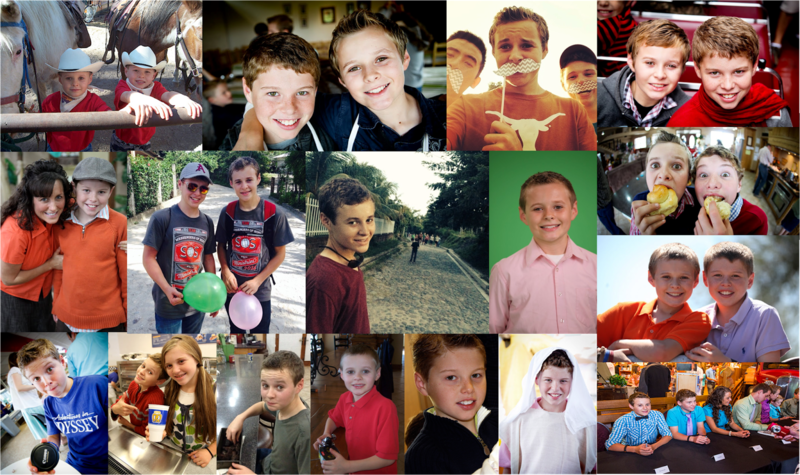 Today is my little brother, John's, 9th birthday! God bless and happy new year to you and yours! Happy Birthday Guys!! I hope you have a great year!! They r getting so big now!! So what are they going to do for there b day. Happy b day from the dominguez family. HAPPY BIRTHDAY JEDIDIAH & JEREMIAH!! HOPE YOU HAVE A GREAT DAY!!!!!! Happy Birthday! Hope your day is a blessed one! Wishing you a day of sunshine,health and joy. Wishing you a birthday that is everything you want it to be and more. happy birthday jed and jer!!!!! My father was a twin and I babysat for twins and loved every minute. They were the best behaved of all kids I for(about 8 kids in my time). I had 6 kids of my own. God Bless you both. Happy Birthday Jed and Jer! You two are turning into amazing young men. I hope i get to meet yall and you family someday. But no matter what, i know that i will meet yall up in Heaven someday. Happy sweet 16, have a great day!!!!!!!!!!! Three more years and you could be courting. Congratulations on getting to the big 16! The Duggars have two sets of twins (Jana & John and Jedidiah & Jeremiah). Do these two fine young gentlemen have their regular drivers licenses yet? Happy Birthday....a little late. Anyone know if they actually get to go here on the Internet to see our good wishes. Happy Birthday Jed and Jer! Hope God will give you many more years of life, and that He will be able to use you for His service. I like these two nice young men. I sincerely hope that their parents give them an opportunity to exercise their intellect and pursue THEIR talents in their future work. They, like Josiah, seem to be more "head-work oriented" and should be given the opportunity to do so. Happy 16 birthday Jedidiah and Jeremiah!!!!!!!!!!!!!!!!!!!!!!!!!!!!!! May God bless you!!!!!!!!!!!!!! !